CBL has worked in several South St. Paul schools. For the featured project, Kaposia Elementary wanted to do something unique in their lunchroom. 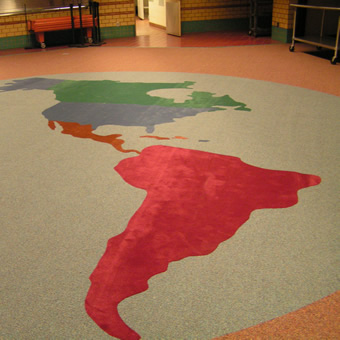 They requested a pattern showing the North and South American continents, Cuba, the Dominican Republic and Puerto Rico – all installed to-scale inside of a 24 foot circle. They wanted all of the countries be represented by different colors to help them stand out. It was also important that the design be durable to withstand daily foot traffic. Design and Product Selection: Because it was a carpeted lunchroom, CBL supplied a high-quality Everset nylon product that carried both a no-edge-ravel guarantee and an Ultra Performance backing, which stops stains from getting into the backing. As for the centerpiece, CBL installation team was able to complete the complicated design themselves. 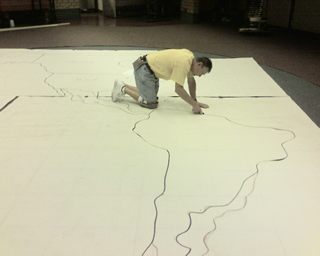 Installation: The CBL installation team patterned the continents to scale and did the tracing and cutting in our warehouse workroom. The patterns were then transferred to the job site and cut and installed in place. The final design was stunning, and Kaposia’s staff received many compliments from students and parents alike.